Native gold, or rather "gold in the metallic state and which is not produced from ores by smelting" (Tylecote 1962), is found throughout Britain and Ireland. In England and Wales sources have been recorded in Cornwall and south-west Wales. There are currently no gold mines dated to the Bronze Age in Europe leading to substantial research projects aiming to provenance gold objects though compositional or isotopic measurements (e.g. Hartmann 1979; 1982). Metallurgical and fabrication processes, such as re-melting, recycling and alloying make it very difficult to relate artefacts and sources. Though there has been no recent provenance research in England or Wales, recent studies in Ireland (Warner et al. 2009) demonstrate the existence of primary (auriferous veins), secondary (gold released from its original host) and alluvial or placer gold sources (gold-bearing sediments sorted by river action). Primary gold is extractable by the simple procedure of local quarrying, heating and quenching the coarse rock, crushing it, and panning the resultant sand whilst a panning technique could be used for secondary gold sources. It follows that surface deposits were probably the initial primary source and it is possible that they followed underground using mining. The comparison between the composition of gold sources and the composition of gold objects, with particular attention at the content of silver, suggests, at least in Ireland, the probable use of local sources in the production of gold objects during the early phase of Bronze Age. It is therefore very difficult to assess whether the gold objects found in England and Wales were made from local sources or gold imported from Ireland or elsewhere. The only evidence for the movement of gold objects relies upon the assumptions based on the typological schemes of objects and the archaeological contexts in which they were found. Though probable goldworking tools such as cushion stones as with the Amesbury Archer Bell Beaker burial (Fitzpatrick 2007) and the later small copper alloy anvils are known (Ehrenberg 1981) as from Knowle Hill, Staffordshire (BM 1992,0901.1), there is no surviving evidence in England or Wales for a goldsmith's workshop. There is no evidence of the purification of the native gold, however, the presence of high levels of copper (?) in the later phases of the Bronze Age potentially indicates the manipulation of the gold composition. 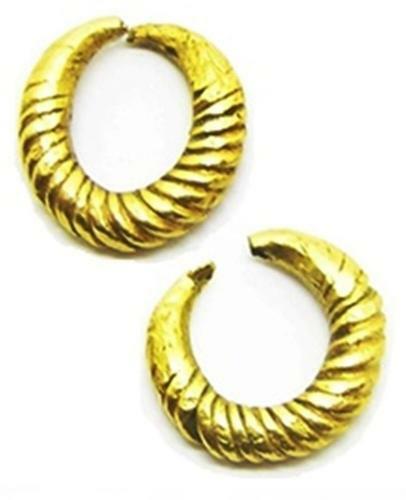 The techniques employed on gold by Bronze Age craftspeople must, therefore, be identified through the close examination and laboratory analysis of the objects and by supporting experimental replication as demonstrated by the Brack's Farm torc study (Taylor 1980, 8-13). The earliest phase of gold working in Britain and Ireland is characterised by sheet-working techniques together with the use of incised geometric patterns or, alternatively, of linear pointillé and embossed decoration. The ornaments produced with this metalworking technique are mainly Lunulae and discs, but other objects, such as armlets, basket -shaped ornaments, plaques, pendant, and beads were also created. The middle phase of gold working in Britain and Ireland is characterized by sheet-working and bar-working techniques. The ornaments produced with the sheet-working technique were decorated with repoussé or incised decoration, while the ornaments obtained by bar-working techniques were decorated by twisting the body. 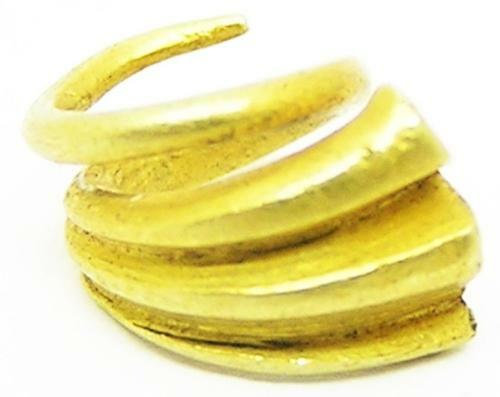 The results of those gold working techniques are mainly neck ornaments such as torcs, bracelets and a diverse range of rings was represented. The final phase of Britain and Ireland gold working, in comparison with the previous periods, includes a far wider range of objects types, manufactures, and decorations. The Late phase of Bronze Age goldwork is still characterized by bar - working and sheet - working techniques but new techniques, such as gold plating, inlaid, and the creation of objects with a hollowed body, are recorded. 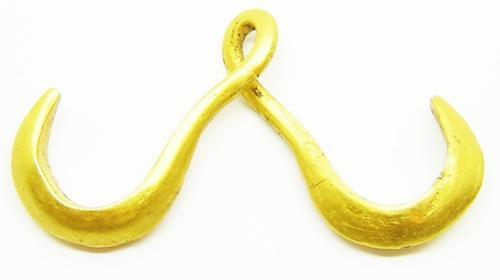 During this period take place, also, the manufacturing of composite constructions that implies the use of a combination of different gold-working skills. The ornaments produced with those techniques were decorated with repoussé technique, incised and punched decoration; the main patterns were grooves, rows of dots, concentric circles, conical projections, concentric and filled triangles, chevrons, diamond patterns and cross-hatch patterns. 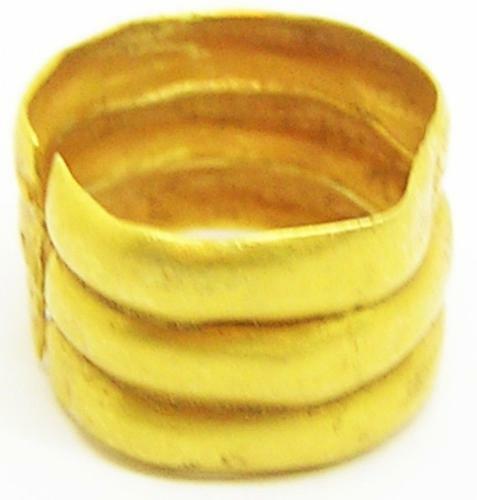 The results of those gold working techniques are mainly neck-rings (torcs, gorgets, and collars), pendants, a diverse range of bracelets, sleeve and dress fastener, penannular rings and lock-rings. Hartmann, A. 1982. Prähistorische Goldfunde aus Europa, II. Studien zu den Anfängen der Metallurgie 5. Berlin. Warner et al. 2009. The gold source found at least? Archaeology Ireland, pp.22-25.